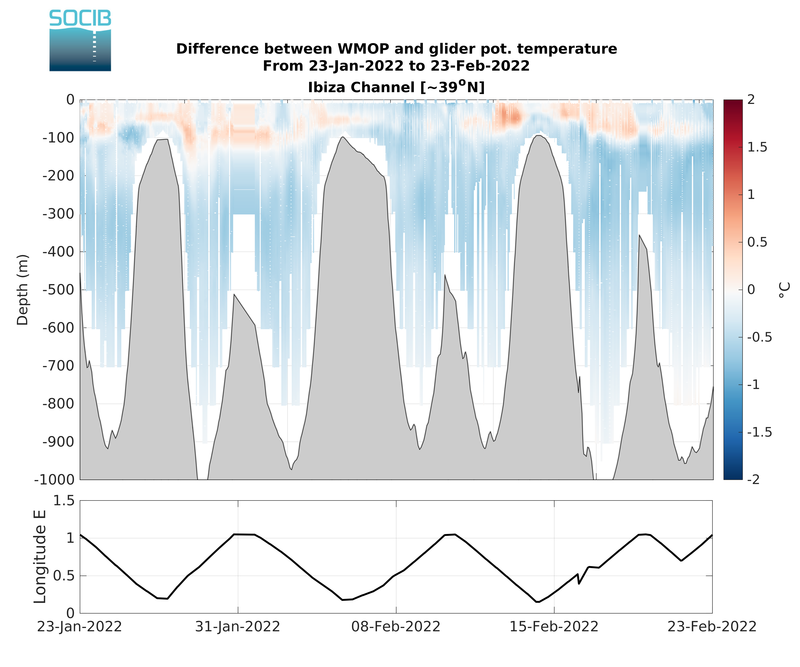 An operational validation system has been developed to systematically assess the model outputs at daily, monthly and seasonal time scales. 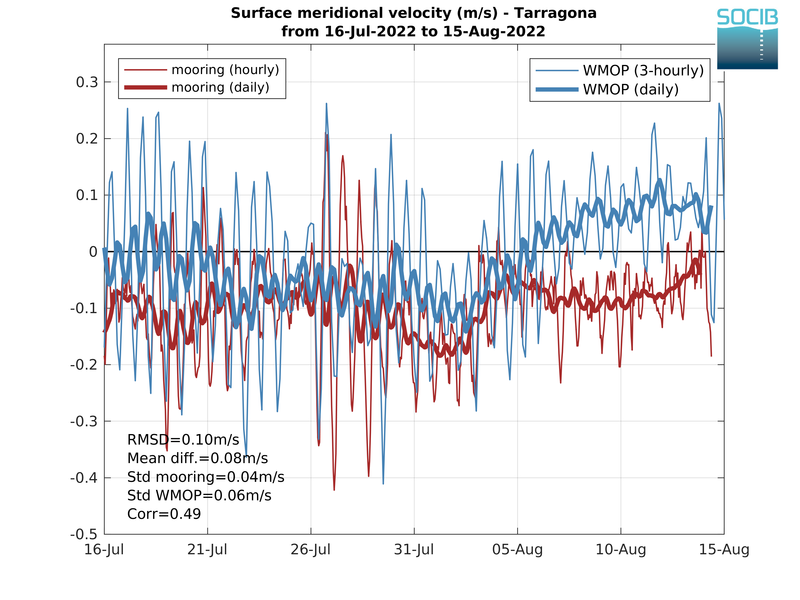 Multi-platform observations including satellite-derived products (Sea Surface Temperature and surface geostrophic currents) and in-situ measurements (Argo floats and fixed moorings) are used for this systematic validation. The WMOP SST is compared in this section to the last available satellite L4 SST product provided by GOS-ISAC-CNR and distributed by the Copernicus Marine Environment Monitoring Service. 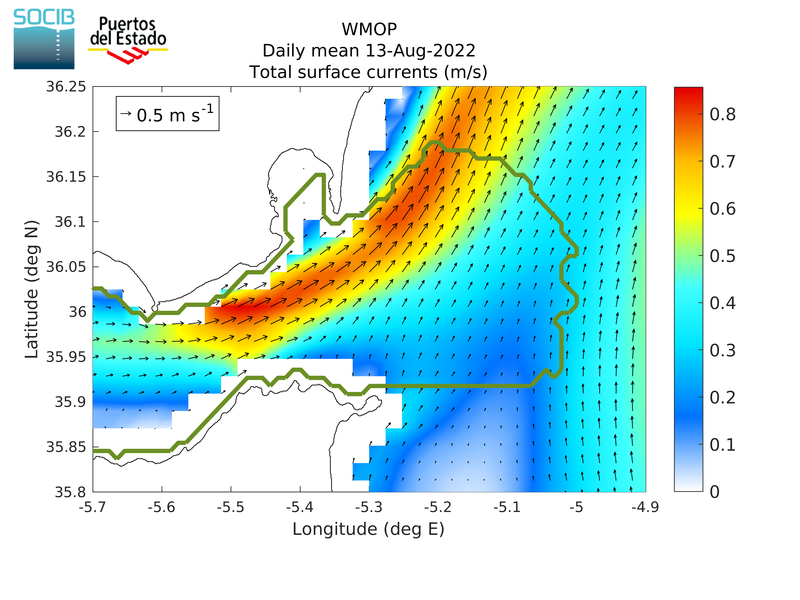 The WMOP surface geostrophic currents are compared in this section to the last available surface geostrophic currents derived from the AVISO SALTO/DUACS Absolute Dynamic Topography altimetry product. 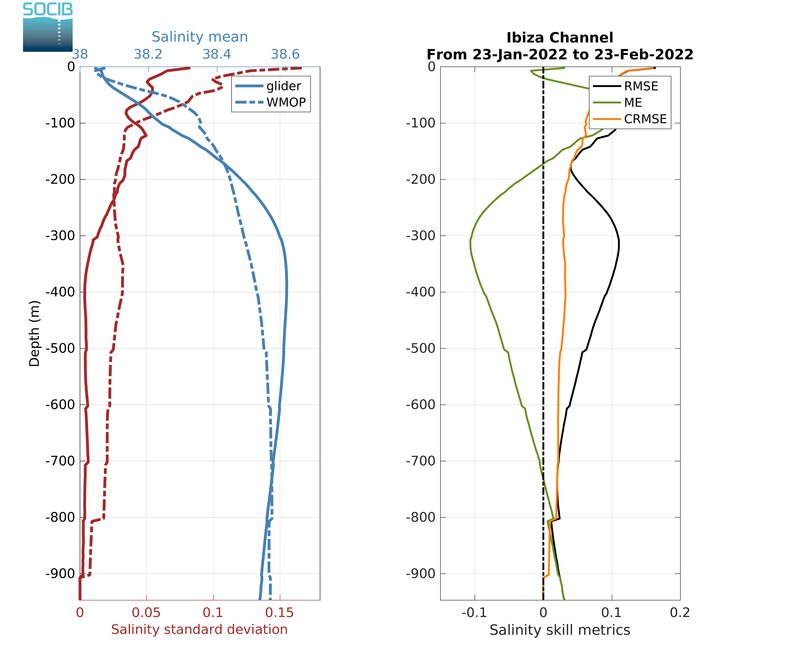 The WMOP vertical temperature and salinity profiles are compared in this section to the last available vertical profiles from Argo floats. 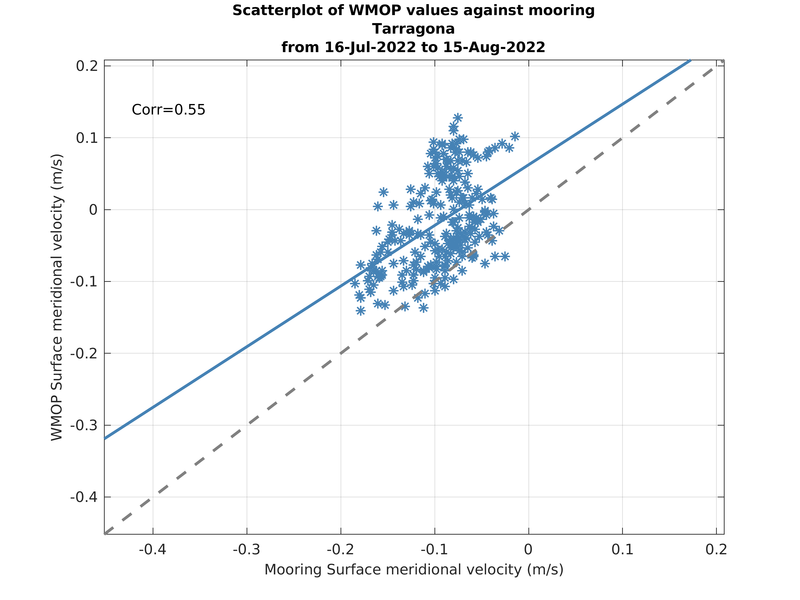 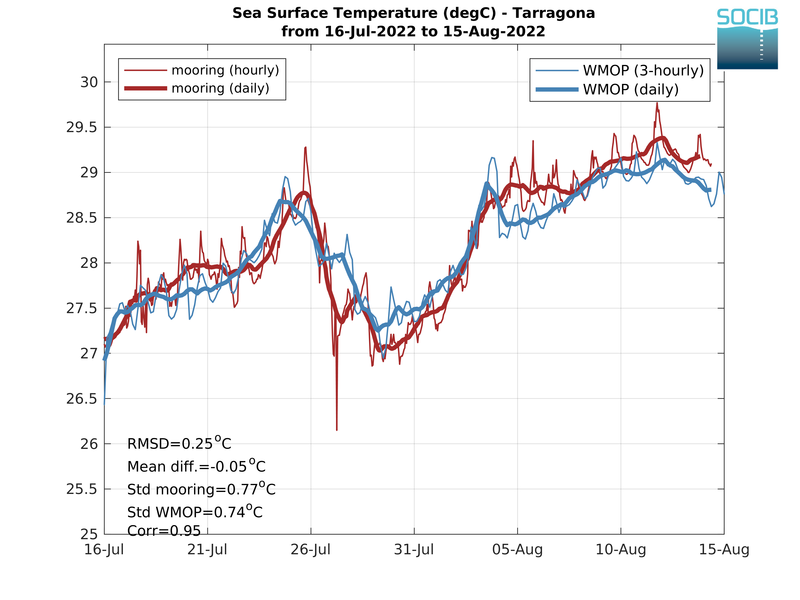 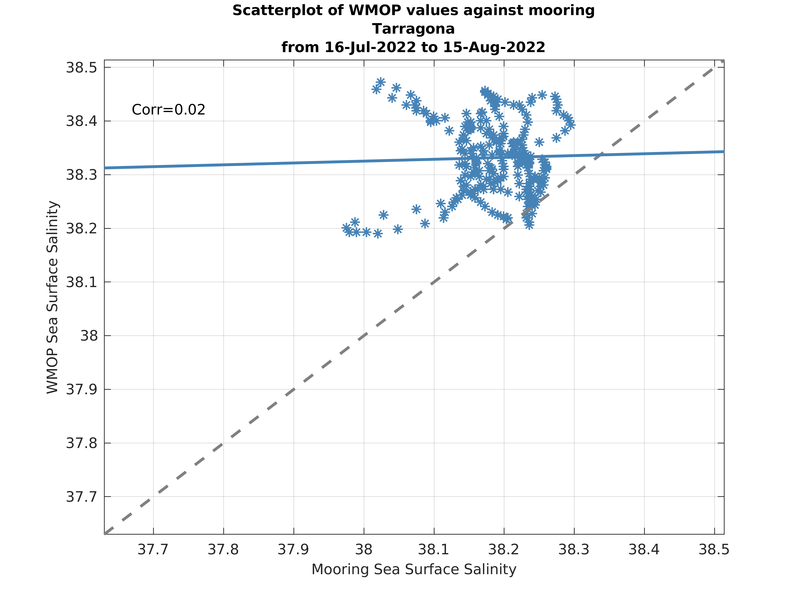 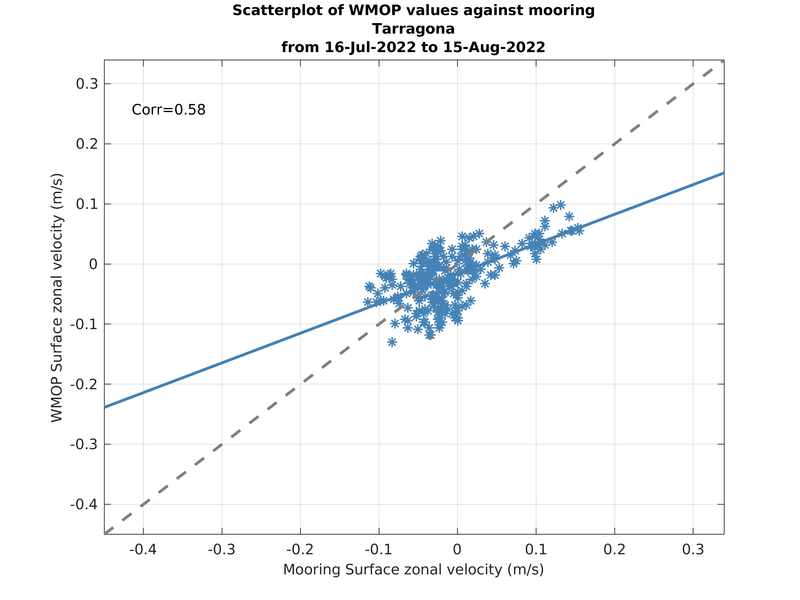 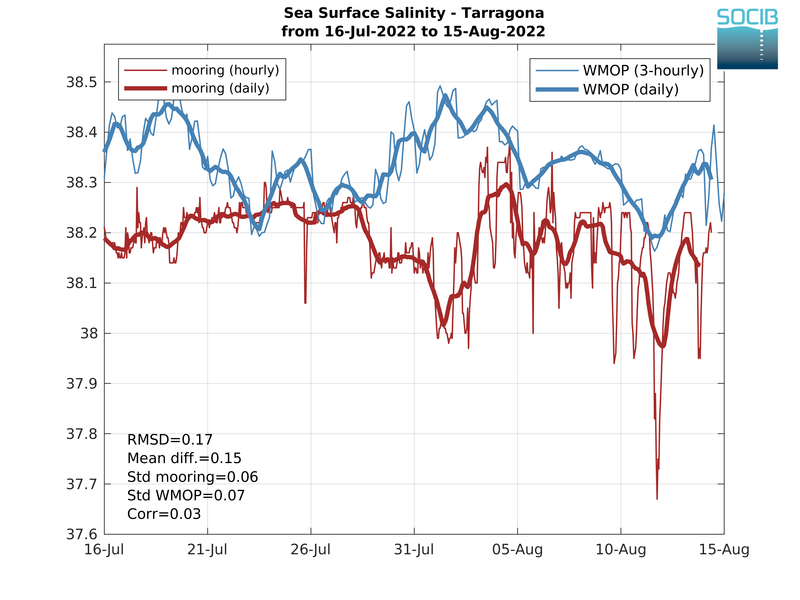 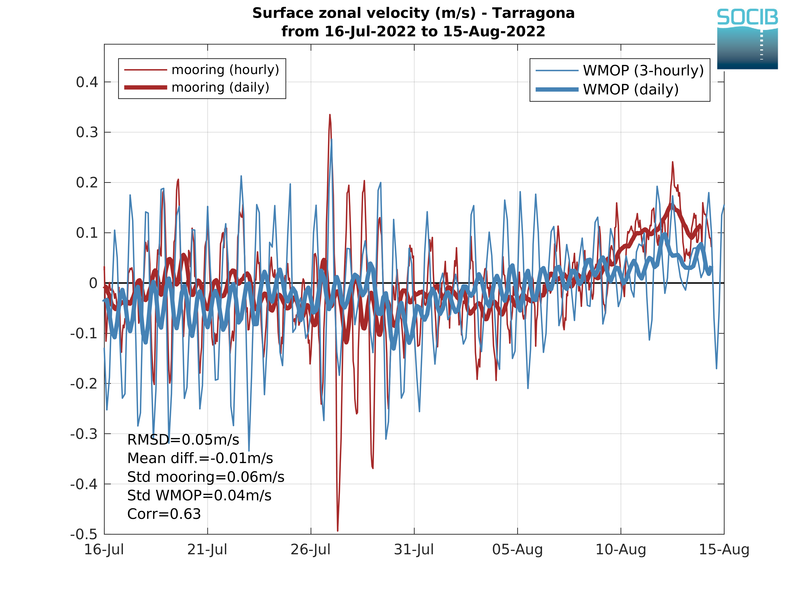 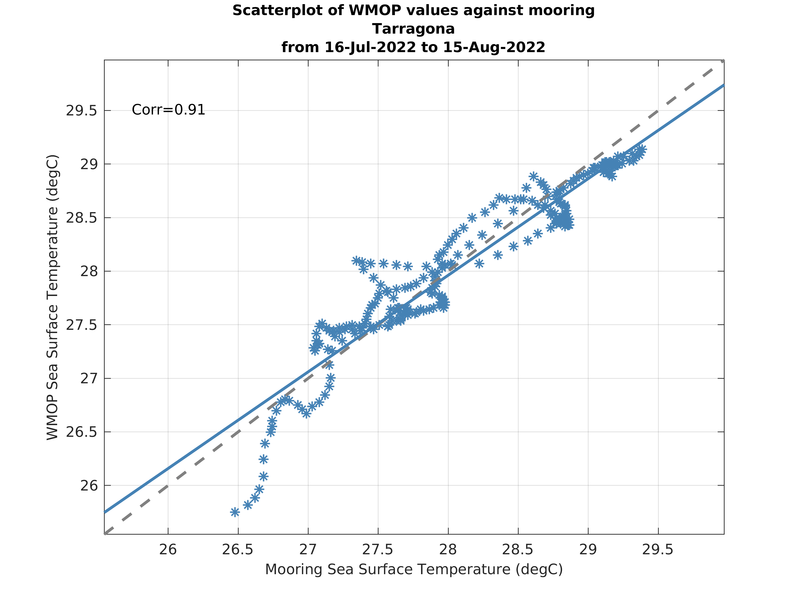 The time series of WMOP surface temperature, salinity and currents are compared in this section to available mooring measurements from Puertos del Estado along the Iberian shelf and from SOCIB in Ibiza Channel and Palma Bay. 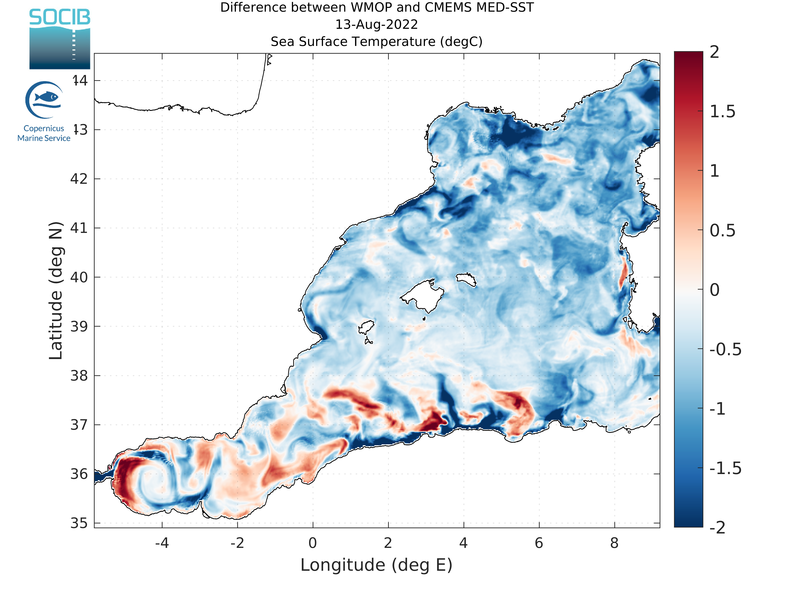 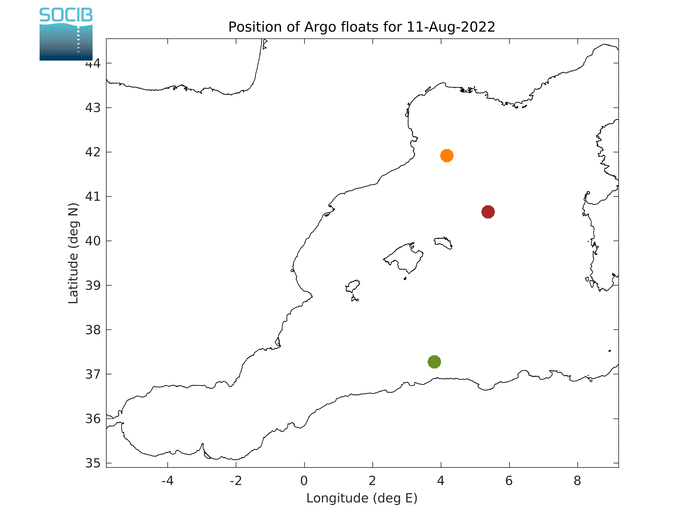 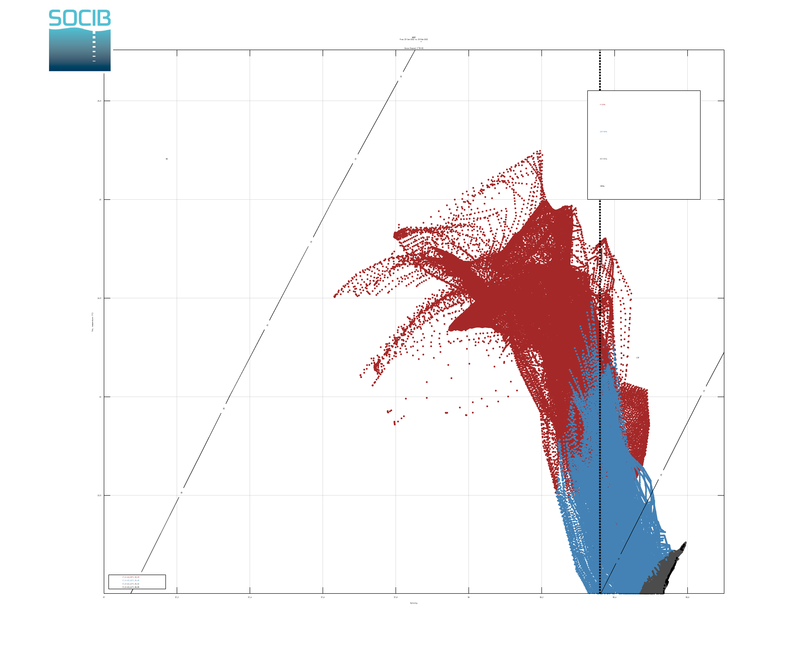 Figure 1: Western Mediterranean bathymetry and position of Puertos del Estado and SOCIB fixed moorings (red dots). 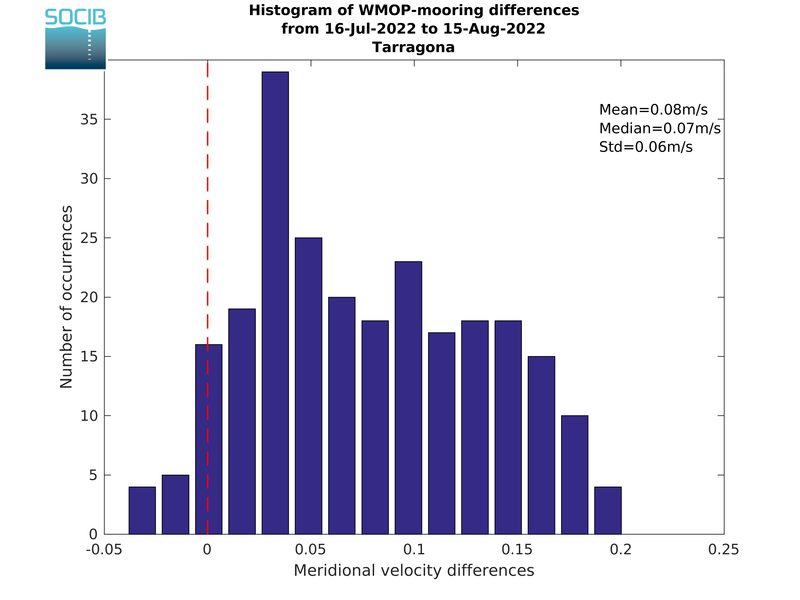 Select the mooring to be visualized by clicking on its position in Figure 1. 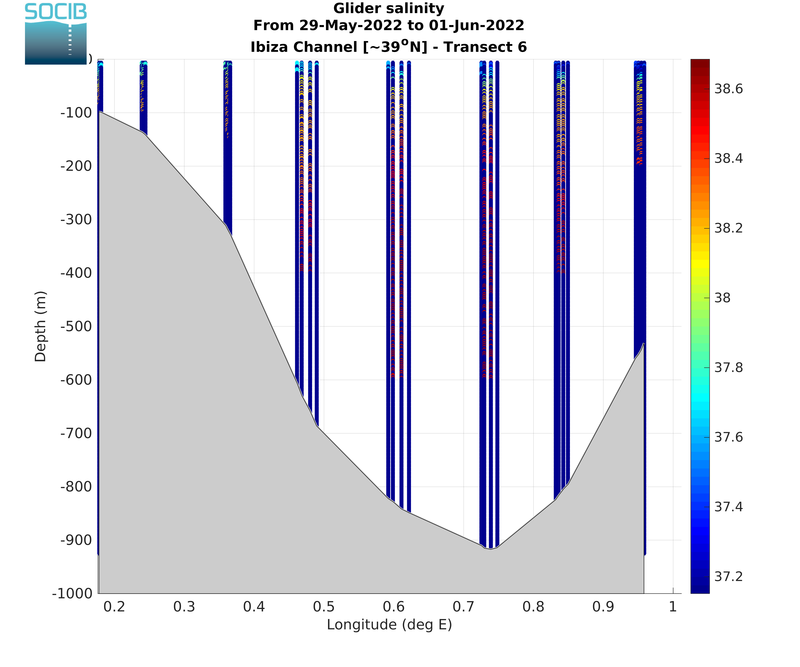 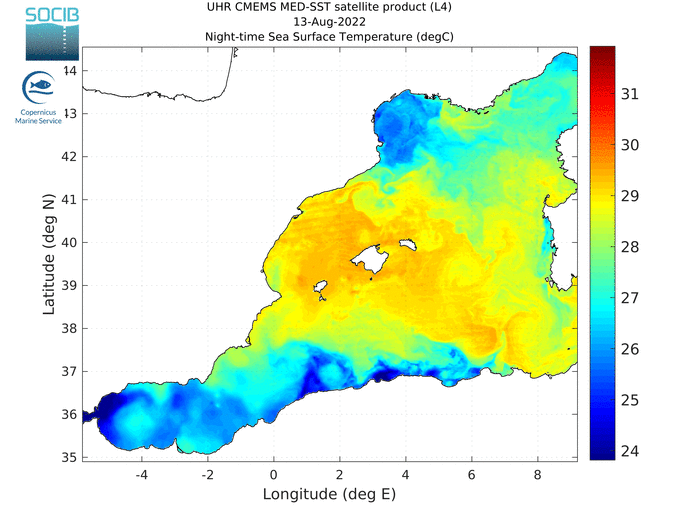 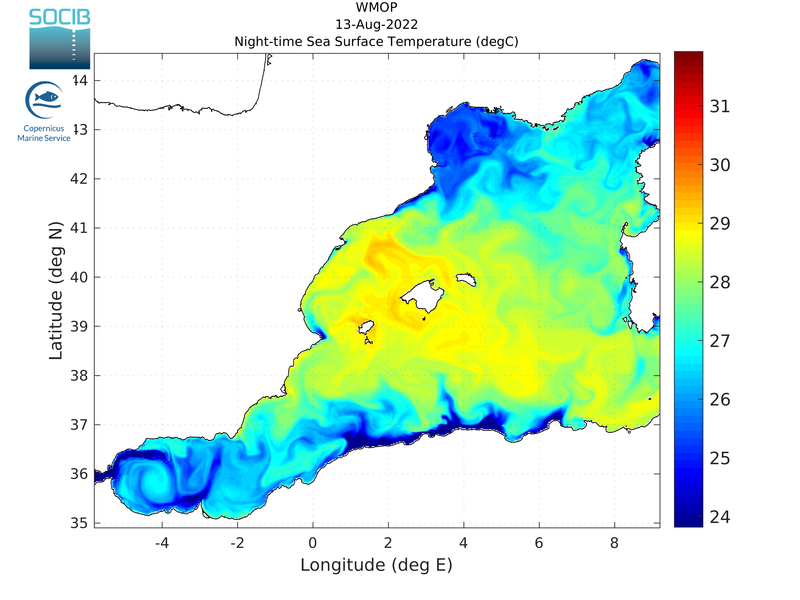 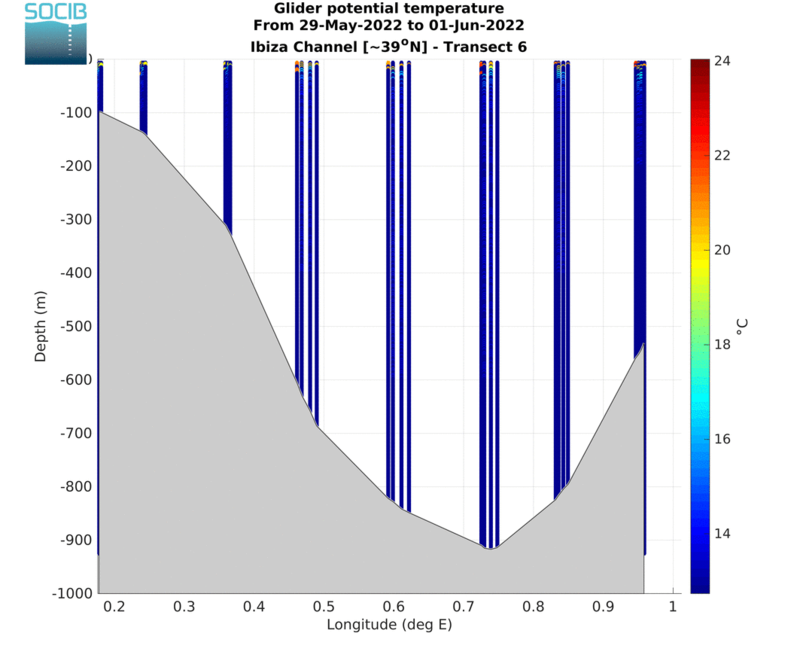 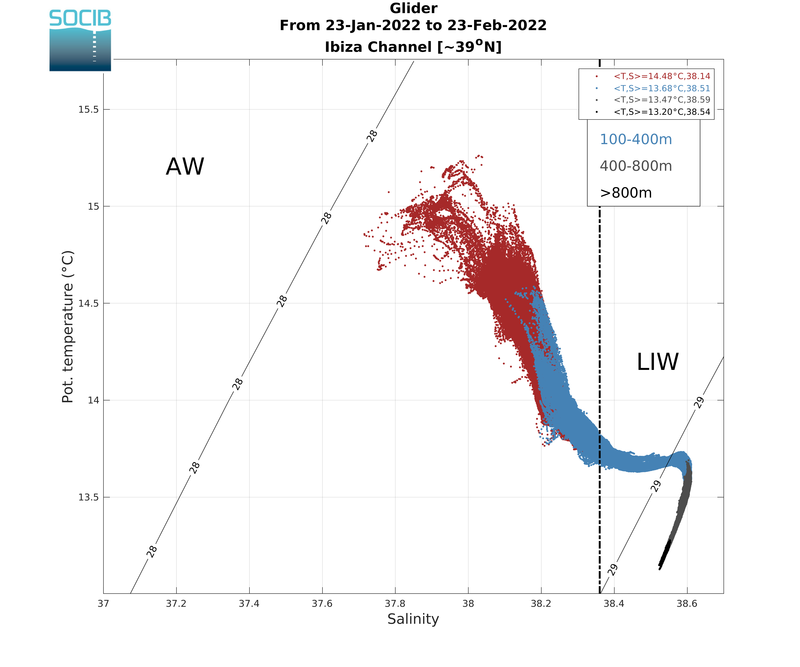 WMOP potential temperature and salinity are compared in this section to SOCIB glider data (L2 product) in the Ibiza Channel in near real-time (NRT) for the last available transect as well as in delayed-time (DT) for all the transects of the last mission once finished and available. 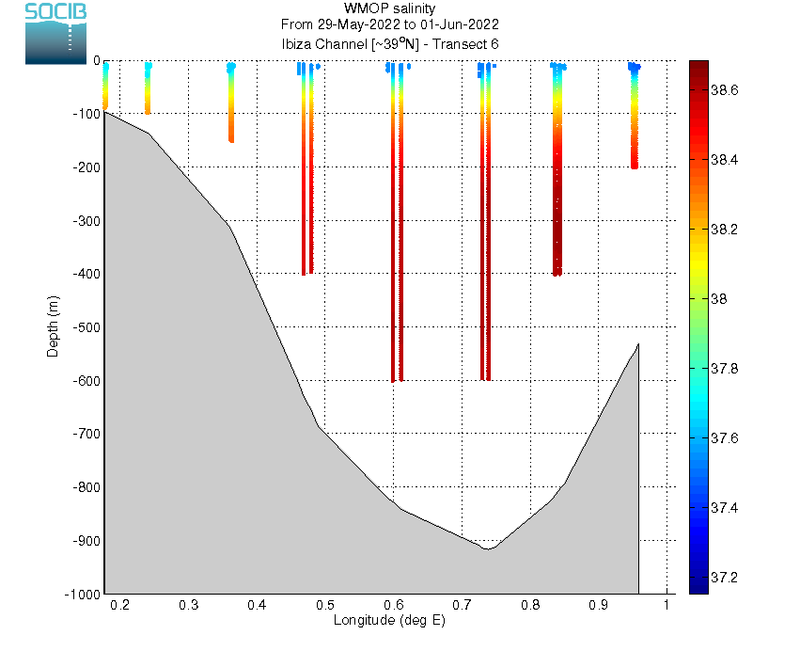 Figure 1: Vertical potential temperature section from glider. 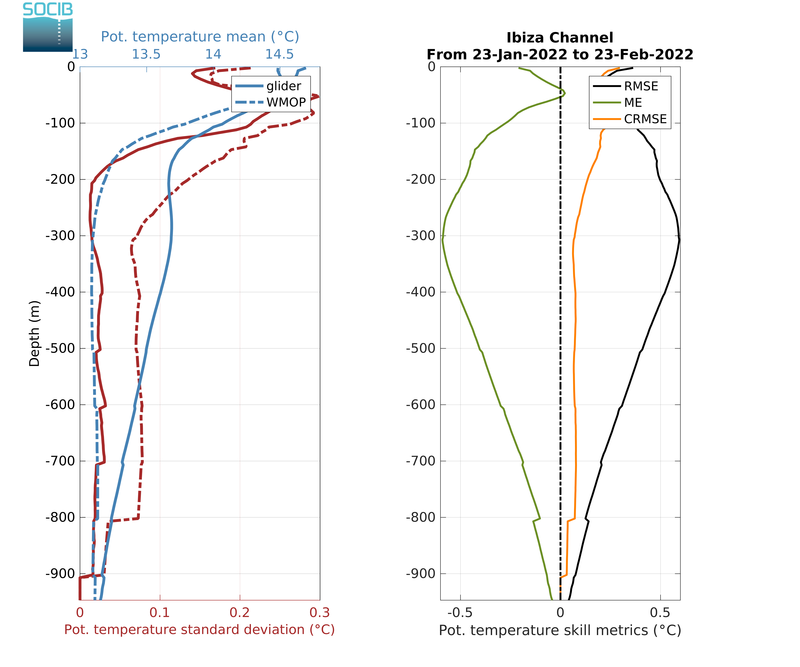 Figure 2: Vertical potential temperature section from WMOP. 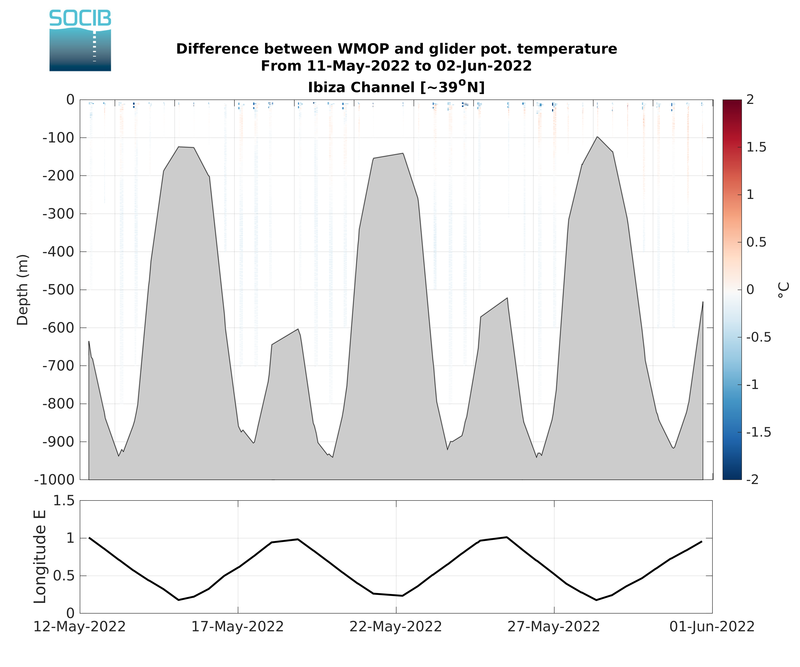 Figure 3: Vertical section of potential temperature differences (WMOP minus glider). 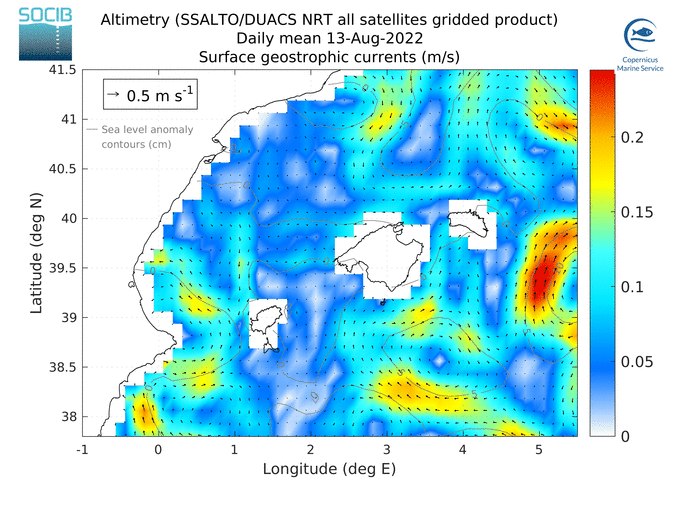 Figure 4: Vertical salinity section from glider. 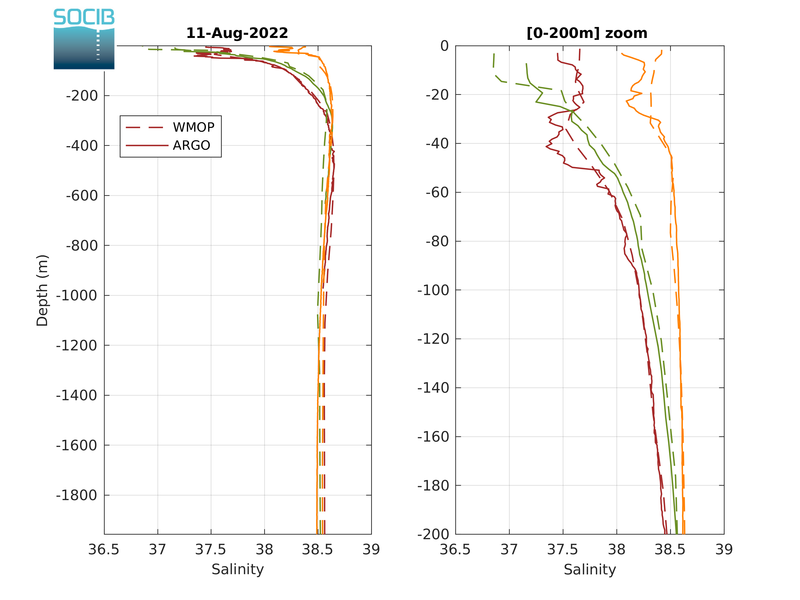 Figure 5: Vertical salinity section from WMOP. Figure 6: Vertical section of salinity differences (WMOP minus glider). 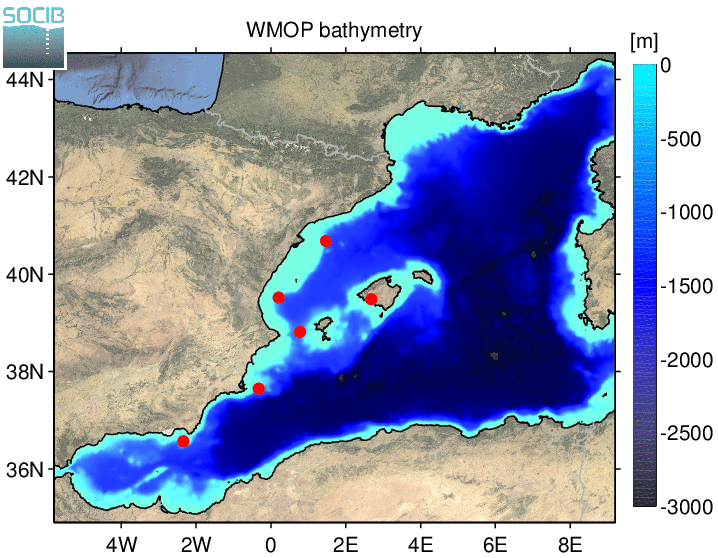 Typical water masses of the western Mediterranean Sea can be identified: Atlantic Water (AW), Winter Intermediate Water (WIW), Levantine Intermediate Water (LIW) and Western Mediterranean Deep Water (DW). Figure 7: T/S diagram from glider. 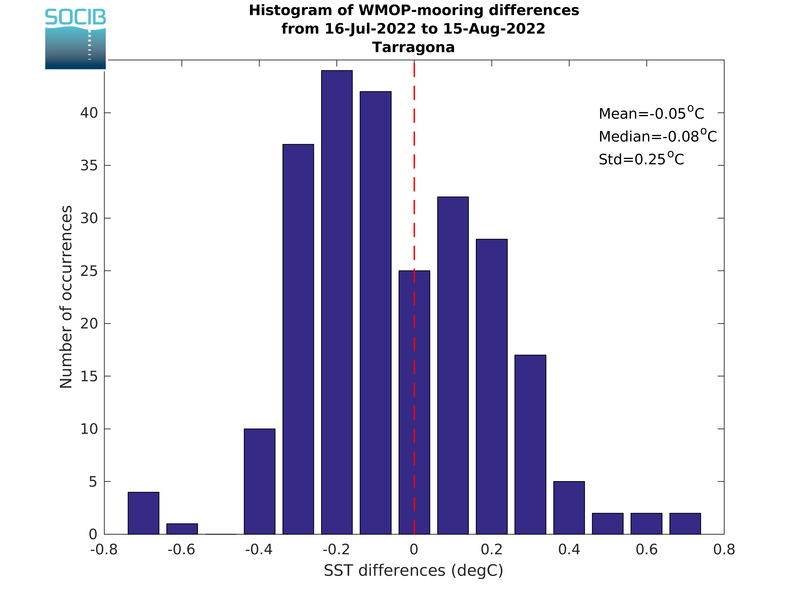 Medians of the T and S distributions are indicated for different vertical layers. 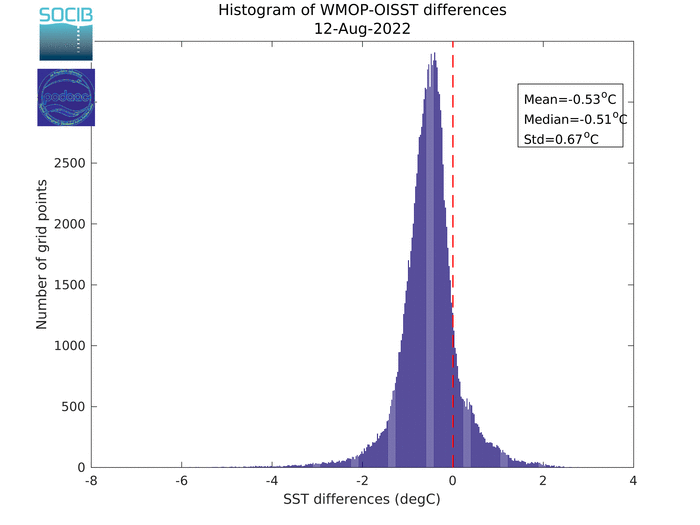 Figure 8: T/S diagram from WMOP. 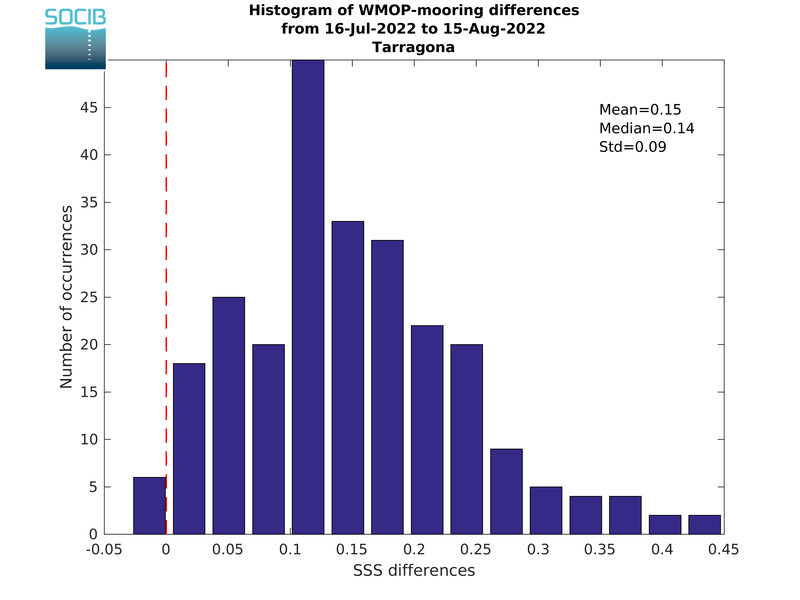 Medians of the T and S distributions are indicated for different vertical layers. Figure 9: Vertical potential temperature sections from glider. 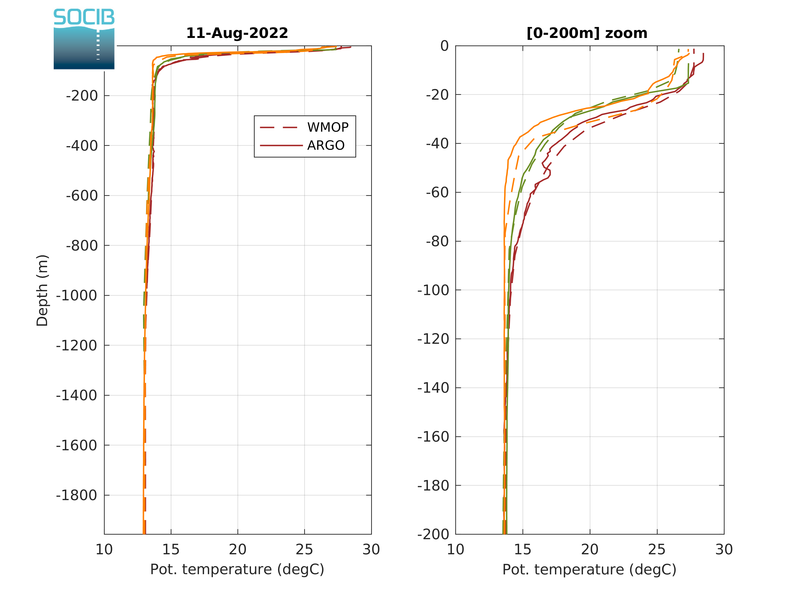 Figure 10: Vertical potential temperature sections from WMOP. Figure 11: Vertical sections of potential temperature differences (WMOP minus glider). Figure 12: Vertical salinity sections from glider. 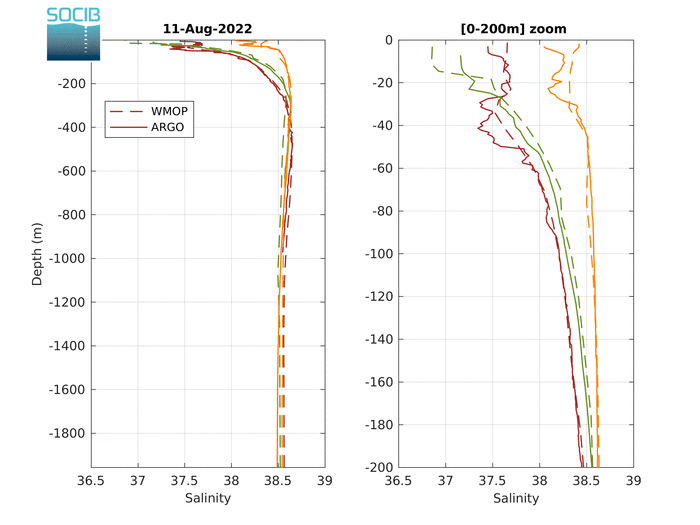 Figure 13: Vertical salinity sections from WMOP. 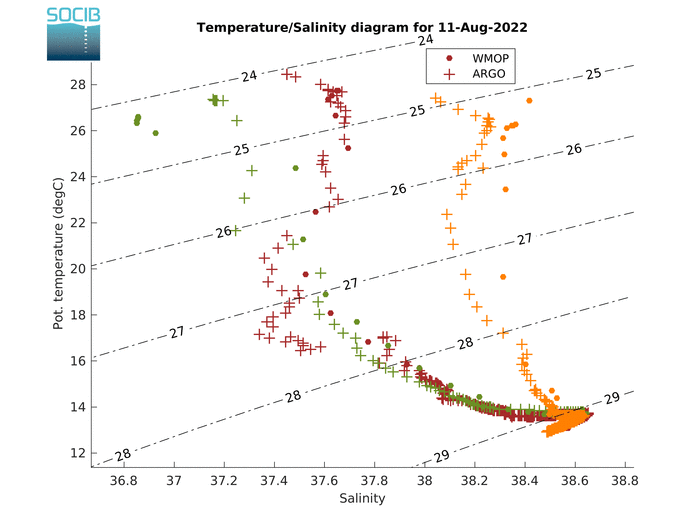 Figure 14: Vertical sections of salinity differences (WMOP minus glider). 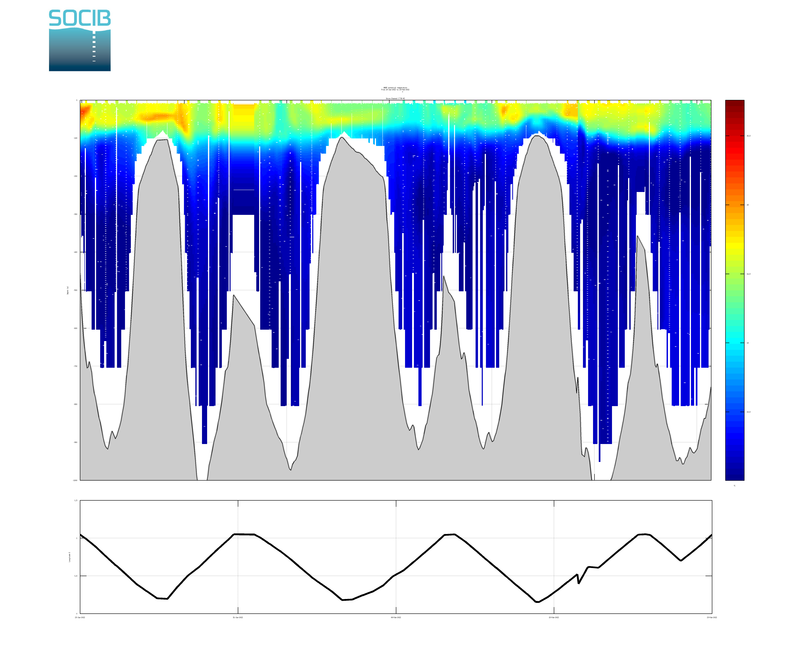 Vertical profiles of statistics and model skill metrics are provided: mean, standard deviation, root-mean-square error (RMSE), mean error (ME) and centered root-mean-square error (CRMSE). 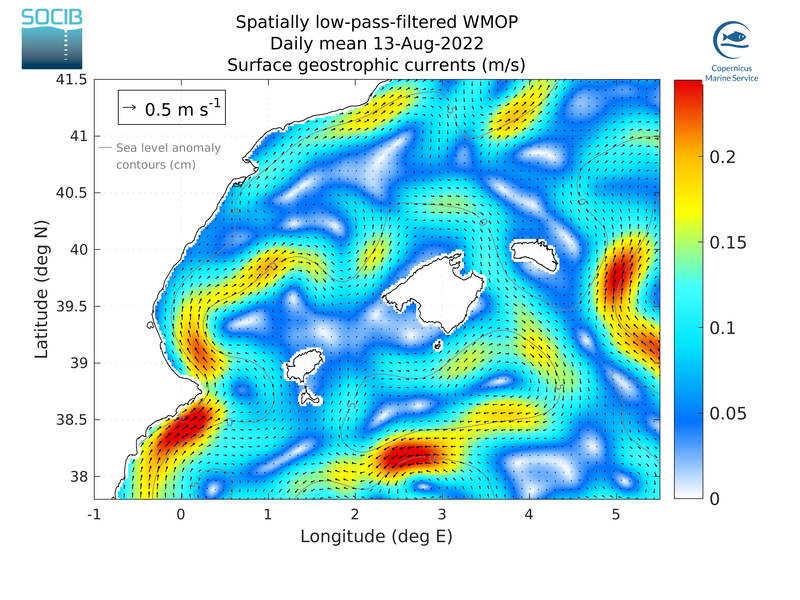 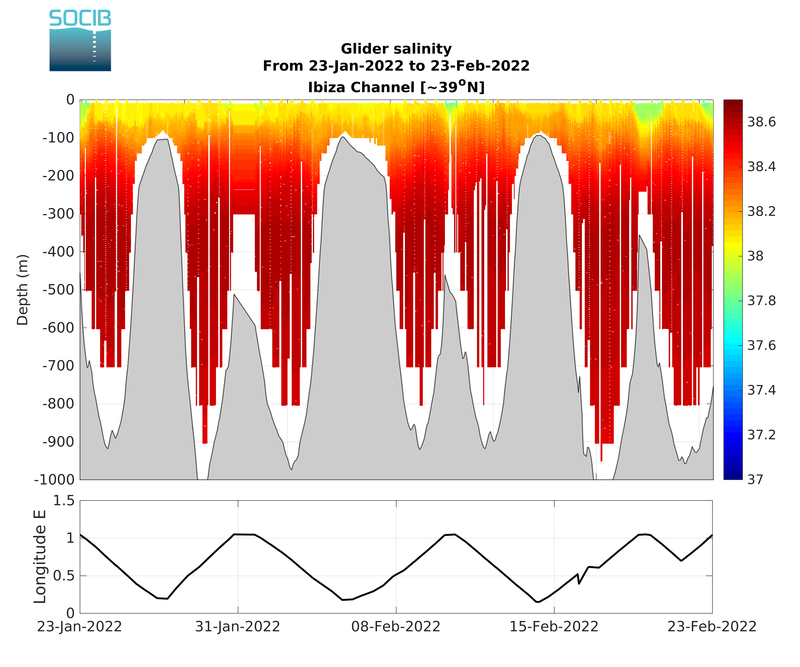 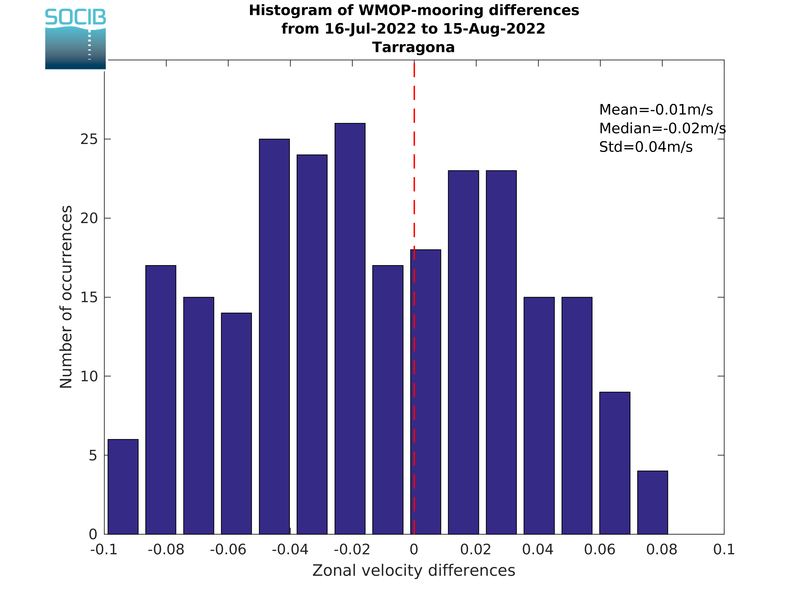 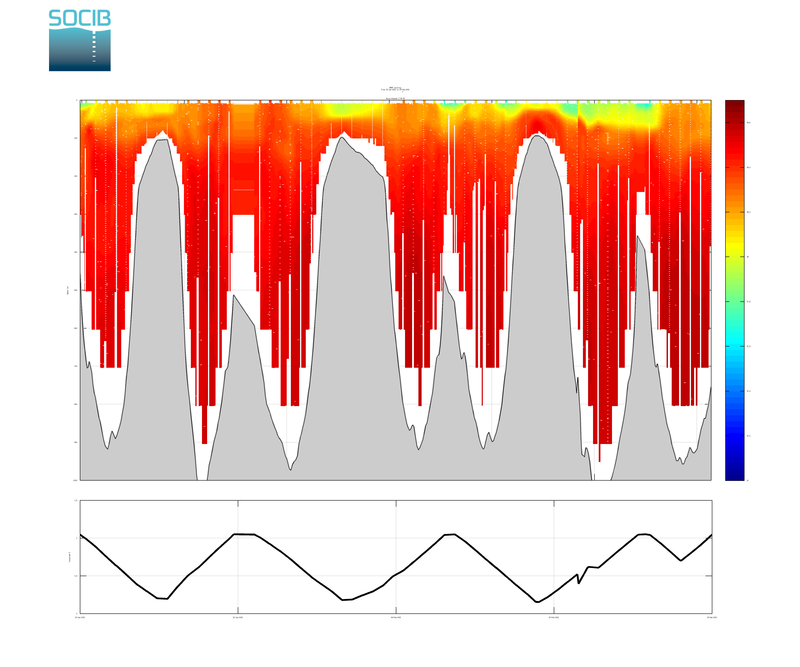 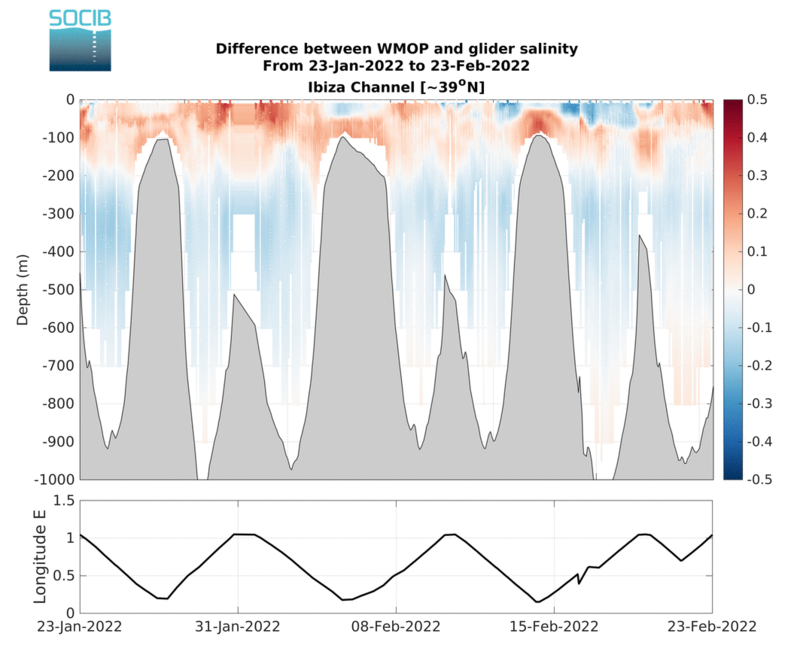 mean and standard deviation from glider and WMOP (left); model salinity skill metrics (right). 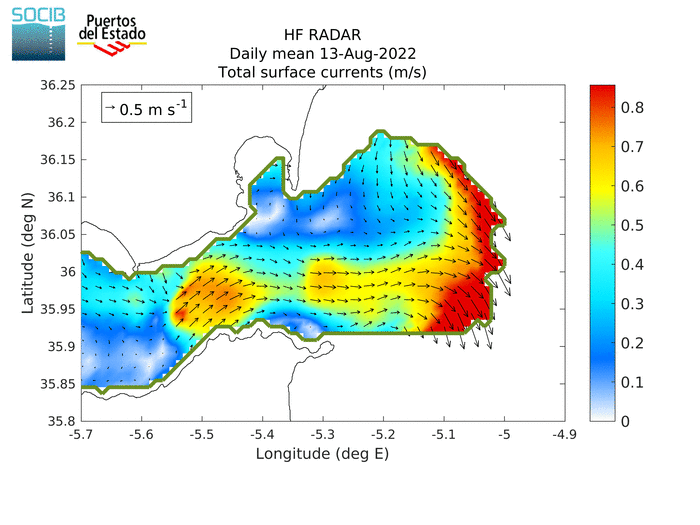 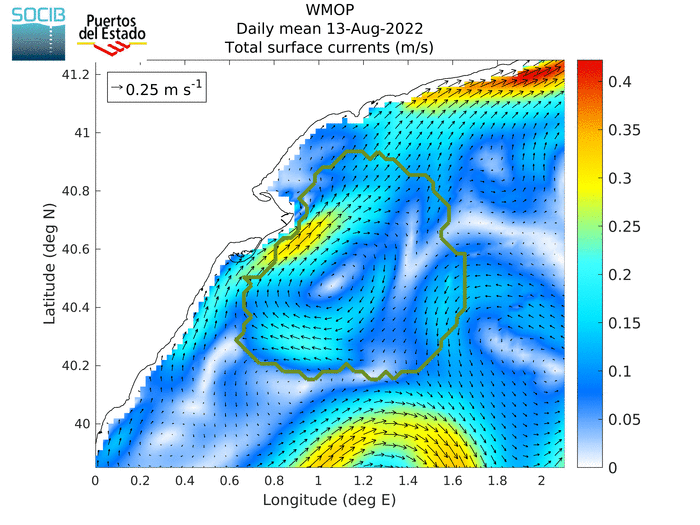 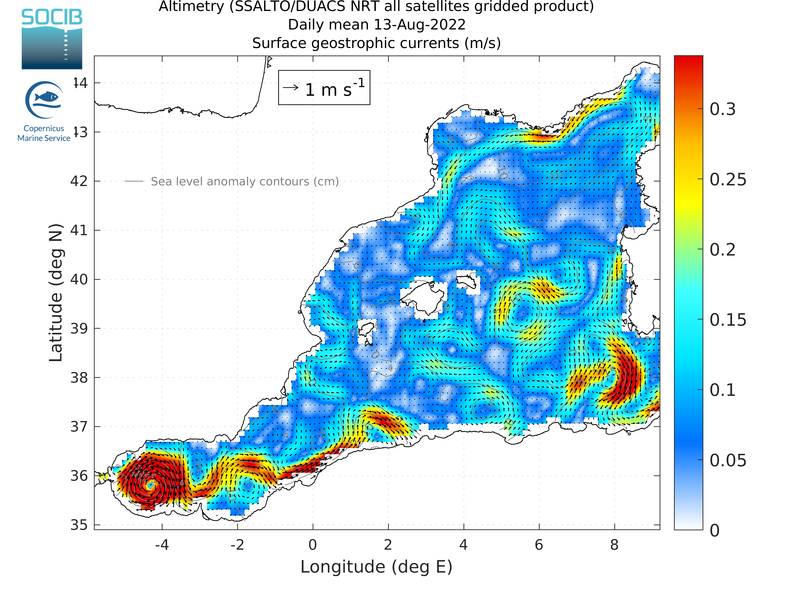 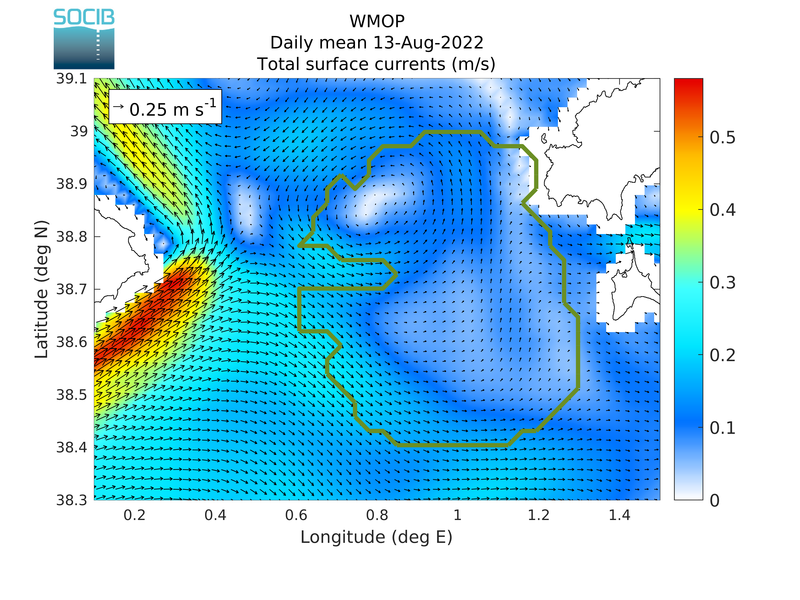 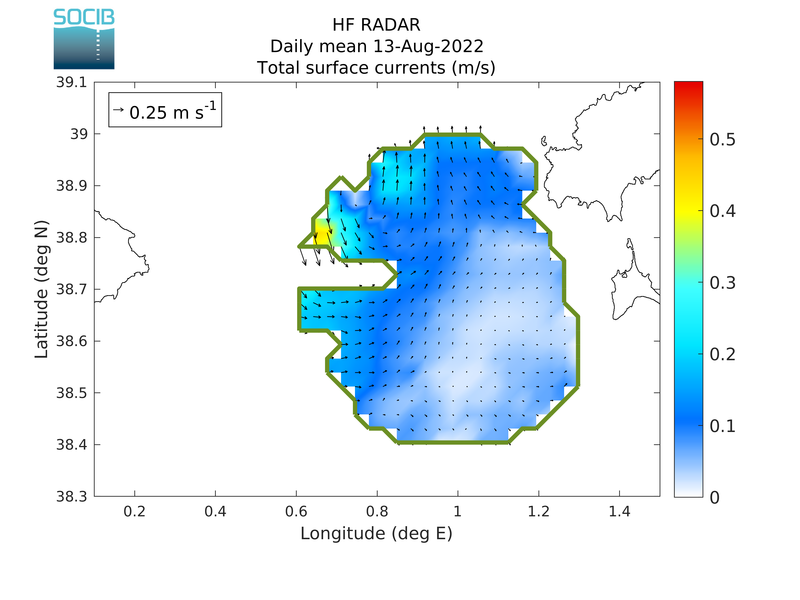 The WMOP daily averaged surface currents are compared in this section to the last available daily averaged surface currents measured from SOCIB and Puertos del Estado HF radar located in the Ibiza Channel, Ebro delta region and Straif of Gibraltar. in the Ebro Delta region. 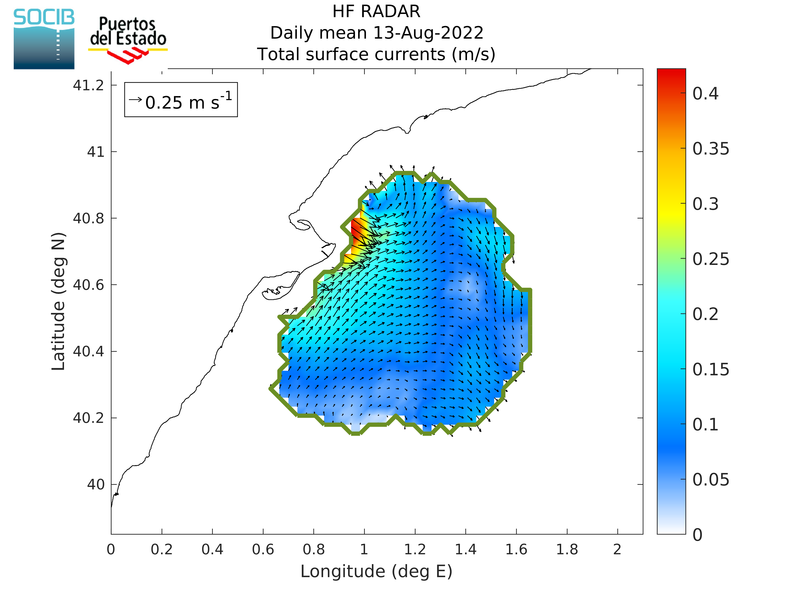 in the Strait of Gibraltar.